I didn't take money from Palestine, says Suha Arafat, the widow of former Chairman of the Palestinian Authority and the PLO Yasser Arafat. Speaking in an interview with Egyptian journalist Wael Al Abrashi she said, "I didn’t take lands from the state of Palestine." Arafat, who is currently residing in Malta, has been accused of stealing donation money from the Palestinian Authority. "After working for Palestine for 50 years, does Arafat not deserve to build a playground for his daughter in Tunisia? I am not ashamed of that but, others came and took over. It's the only investment he did for Zahwa and I have the papers to prove it." "He didn't buy her jewelry or build her factories, just a little playground in Tunisia. I have nothing to hide. Yasser Arafat is the one who ordered the playground to be built." 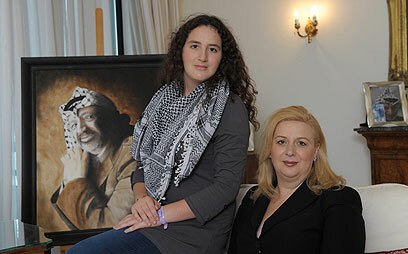 The interview also exposed Arafat's only daughter, Zahwa, for the first time. Although she was present during one part of the interview, her mother made sure Zahwa would not utter a sound. "She wants to be a lawyer. Having seen what they did to me, she has absolutely no interest in politics," Suha noted, adding that her daughter loves literature and art. At one point in the interview, Zahwa presented Suha with her report card. This caused Arafat to become emotional and she said had Zahwa's father been alive he would have been proud. Later, Suha was also forced to address some difficult questions. Asked why she chose to give birth to her daughter in Paris and not in the territories, she said: "My father was on his deathbed and in hospital and that is why made the decision. I refused to give birth in Israel – I told them (the Israelis) - 'You ruined the whole of Gaza, you were the ones who destroyed our hospitals, not us.'" She added that she was against normalizing relations with Israel and had refused many offers by Lea Rabin, former Prime Minister Yitzhak Rabin's wife, to visit Israel. "How could I go to Tel Aviv when our women prisoners are in jail," she said. See all talkbacks "Suha Arafat: I never took money from Palestine "